To accommodate super-wide vehicles on a 4,082-kg. capacity four-post lift, choose the HD-9SW. The “SW” stands for super-wide, and it’s the ideal four-post lift to double your parking and/or service wider vehicles. There are thousands of vehicle types out there, and some come a bit wider than others. That’s no sweat for the HD-9SW, a four-post lift that sits fat and happy when it holds vehicles with wider frames. Plus, if you need a lift that offers truly gigantic proportions, the HD-9SWX is one heck of a choice. If your vehicles are tall, heavy and wide, and they need to be stacked or serviced, we can probably lift them. Both models are perfect for a “wide” range of vehicles. With all the same great parts and components as the HD-9, our super-wide lift is equally safe and efficient. Check out the working parts and components below to see what makes a BendPak better than the rest, no matter what height/width modifications we make for your pleasure and convenience. Single-hub cable sheaves represent the cost-cutting way to make a car lift. Not our way. BendPak double-hub sheaves reduce friction against the cables while also extending the life of the ​lift axles. Multiple lock positions permit operators to safely stop the lift at the right height for them, or simply adjust to the right height for the job. This is also useful for parking vehicles under the raised lift. Depending on the height of your vehicle(s), and depending on your ceiling height, you can adjust the lock position. Four lifting cables help ensure a level rise. Each is constructed from high-grade stainless steel and rated to handle 6,350-kg​. Combined, the four cables can hold 640% more than this four post lift’s rated capacity. Of course, the cables are tucked away into the lift structure. This streamlines the lift design and maintains the sleek look of your shop. It also protects the cables from environmental damage, spills, etc. The electric-hydraulic power system is totally maintenance-free. Controls are ergonomically placed and easy to use, so you’re totally at ease while operating the lift. 254 mm x 305 mm base plates can be bolted down or left unbolted for use with the caster kit. We encourage you to work in a way that’s best for you. A 4-piece caster kit fits this super-wide four-post lift like a charm. With your lift on wheels, there’s no limit to where you can work and park. Remodeling projects are also easier to plan and execute. All moving components are located within the structure. This isn’t just about looks (although it certainly helps with that too). The integrated design addresses a major safety concern: externally routed components are exposed to additional dangers and damages. BendPak avoids these altogether. The runways on this BendPak four-post lift rise just 114 mm off the ground. Add the gently inclining ramps, and you can lift virtually anything. Not only are our runways low-profile, we extend them farther than others in the industry. 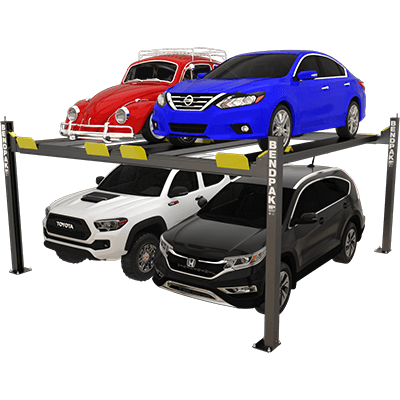 This makes for a car lift that can load sports cars and other low-standing vehicles without damaging them. Engaging the locks is as simple as raising the ramps just past the lock (you’ll hear it click as it passes) and lowering them back on the lock. Check to make sure all locks are on the same position—safety first, after all. And that’s all there is to it! Your four-post lift can be held in that position indefinitely. *Not all BendPak lift models meet the standards as prescribed by ANSI/ALI ALCTV-2011 or ANSI/UL 201. Consult www.autolift.org for a complete list or contact BendPak via contact@bendpak.com.